The evocative title of Robert Lanning’s new study of Adorno’s thought is derived from a comment made by Georg Lukács in The Theory of the Novel in 1971. Lukács originally used the image as a description of Schopenhauer’s elaborate philosophy of pessimism and despair, comparing it to a ‘modern luxury hotel on the brink of the abyss, nothingness and futility. And the daily sight of the abyss between the leisurely enjoyment of meals or works of art, can only enhance one’s pleasure in this elegant comfort’(quoted 29) .On further consideration, Lukács remarked that the simile was also appropriate as a description of Theodor Adorno’s situation in California during the 1950s. The agenda of Lanning in this work is to provide the conceptual evidence to substantiate Lukács’ implied accusation that exile in the US involved the abandonment on Adorno’s part of any authentic connection to the Marxist project of proletarian emancipation. The sub-title is indicative of the author’s sympathy with that project and his conviction that its continuation should not include any significant element of the Adornian perspective. An accusatory tone is sustained throughout and makes for an invigorating and provocative read. Lanning states his position unambiguously in the Introduction: ‘Adorno avoided the class struggle altogether and without that his attempt at exploring the relation of theory to practice and vice versa were insufficient to sustain his connection to Marxism, however tangential he claimed this to be’ (16). Lanning’s dissection of the eponymous philosophical framework cumulatively succeeds in building a powerful case against its subject, although sometimes the evidence seems so overwhelming that the reader might suspect there must be something worth salvaging from the wreck that Adorno’s reputation has become in some quarters. The philosopher in question was often keen to revert to the ‘message in a bottle’ (10) image to convey his political perspective, and to some extent, it elusively survives Lanning’s theoretical onslaught. The focus of the author’s critique is on key components of Adorno’s thought but Lanning also ticks off familiar complaints that have been made by other commentators about how the philosopher failed to engage practically with the great social and political upheavals of his lifetime. 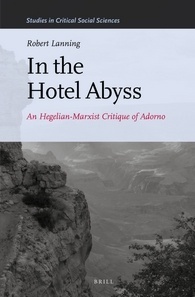 Lanning posits that the very categorisation of Adorno within the Marxist canon has to be disputed ‘in the sense that Marxism requires a certain orientation to analysis with a view to concrete action that begins with the struggle between social classes and requires continuous attention to the relation of theory and practice and to the development of consciousness’ (16) . This lacuna in outlook was partly shared by others members of the Frankfurt School,Lanning continues, but was more deeply entrenched in Adorno’s case than with some of his colleagues. Figures such as Bloch, Benjamin and Horkheimer aspired to maintain some relevance to political practice, the author suggests, whereas ‘Adorno was more emphatic than others in his dismissal of the working class’ (10). There might be some validity in this baleful view of Adorno’s interaction with everyday politics but it is hardly fair of the author to highlight the philosopher’s so-called ‘spoiled ‘ upbringing (25). Marx and Lenin also noticeably spent their formative years amid bourgeois comforts but only the most one-eyed ultra-leftist would hold that against them. More serious is Lanning’s accusation that Adorno’s half-hearted support for Walter Benjamin was a contributory factor in the latter’s failure to escape the Nazi occupation of France in time and consequent death on the Spanish border in 1940 (152). Lanning also denounces Adorno for his conspicuous failure while in exile to engage with the radical politics that exploded in the US in the second half of the 1930s,with huge factory occupations breaking out among auto-workers in the Mid-West and dock strikes on the West coast (27). A more sympathetic study might suggest Adorno’s reluctance to get involved at this time was due to his inexperience of the American context as a recent immigrant and also his understandable concern not to jeopardise his legal status and face possible deportation back to Nazi Germany. Lanning also draws attention to the awkward facts that Adorno permitted his work in the 1950s to be published in US Army-funded journals and also delivered lectures to NATO generals (12). These incidents certainly sit uneasily with Adorno’s aspiration to the status of Marxist intellectual guru but they would not make him the first radical thinker to mix with dubious company. Lanning is on stronger ground in his attack on the philosopher for staying aloof from the upsurges of leftist activism in the 1960s, generated by the fight for civil rights, the student protests against the Vietnam War and the rise of second-wave feminism (27). Adorno’s position in Western academia and society was secure by this time and it is difficult for any defence of his radical credentials to justify his disengagement from this critical period of emancipatory politics. Lanning is scathing about his subject’s orientation in this period: ‘Politically Adorno was and remains a safe bet behind the lectern, inside his books or as a subject of debate; he would not be on the side of the class struggle if that was possible, nor would he stand in the middle, for him the class struggle was already lost’ (25). The author’s assertion regarding Adorno’s ambiguous status in bourgeois society in the last couple of decades of his life is that the thinker clearly had given up on any serious pretence to challenge the status quo and that he was, in fact, content to take his place among the academic elite. Adorno’s long-term goal, Lanning argues, was to acquire a position ‘as a detached intellectual, free-floating in a Mannheimian sense’ (12). This evident agenda also explains, according to Lanning, the notoriously opaque style of Adorno’s output which has acquired a reputation for near-impenetrability among both his defenders and critics. Such a method, Lanning notes, is ‘hardly conducive to attracting the interests of working class activists to a comprehensive and coherent analysis of capitalism and the possibility of transcending its limitations on human development’ (9). This is an important criticism of Adorno and it is indubitably true that his work is far removed from the compelling and direct writings of more engaged Marxist theoreticians such as Lenin or Trotsky who explicitly aimed most of their writings at working-class audiences, with an agenda of effecting action. However,Lanning seems to be implying that lack of immediate transparency should automatically rule out the worth of radical theorising, which if true, would exclude significant chunks of Marx, Gramsci, Lukács and other indispensable icons of the left. The most substantive part of Lanning’s critique is that Adorno’s distinctive notion of non-identical thinking is counter-productive for revolutionary politics and ultimately leads down a conceptual cul-de-sac. Such a destination might be acceptable for ‘free-floating intellectual’, Lanning argues, but is hardly appropriate for a thinker who claims association –however tenuous – with the project of working-class emancipation. Adorno’s best known work, Negative Dialectics (1973) is posited on a radical reworking of Hegel’s framework of dialectical process in his Science of Logic (1816). The latter, according to Adorno, was responsible for excessively effacing differences in thought and falsely reconciling contradictions into a self-identical whole. Identitarian thinking paved the way for the totalitarian horrors of the twentieth century, including Auschwitz and the gulags of Stalin’s Russia. In contrast, Adorno sought to revise the Hegelian model by reclaiming the negation of the negation as the critical phase of dialectical motion, allowing multiplicity and dissonance to remain beyond the grasp of subsumption, either by an individual mind or a political regime. Avoiding the telos of Hegel’s Absolute Idea, according to Adorno, preserves the heterogeneity and contradictions of genuine dialectical thinking. He further argues his version of the dialectic avoids the conservatism and stasis that is built into its Hegelian counterpart and which has been exploited by elites in a variety of contexts to justify oppression. Lanning notes the intended political connotation of Adorno’s re-orientation of thinking: ‘Adorno’s approach is intended to demonstrate such stasis in human thought and relations that are sustained by the ideological position of identity between ideas and things in which a stated concept or relation of equality between elements, such as concept and reality, carries a legitimacy that is an offense against contradictions in reality’ (185-6). Initially, Adorno’s reconfiguration might seem appealing to the revolutionary mind-set focused on undermining hegemonic sources of authority and power. The thinker’s desire to preserve multiplicity and difference at all costs also explains his posthumous popularity with the founders of deconstruction and postmodernism. Lanning insightfully explains that such an emphasis might be conducive for the endless inter-play of textual scrutiny in the institutions of the bourgeois academy, but it is of negligible value to the political project of an assault on the citadels of capital. Unlike Adorno, Lanning’s focus is consistently on the utility of conceptual analysis for revolutionary activity, as it was for less problematic figures in Marxist theory such as Lenin, Trotsky and Rosa Luxemburg. He argues that Adorno’s negativism had a superficial appeal to the post-war left in the West that had witnessed the degeneration of the hope of 1917 into the squalid terror of Stalin, Mao and others. In contrast, Lanning provides a robust defence of Hegelian dialectics and an incisive attack on its Adornian rival. The latter, he argues, misconstrues the importance of sublation and mediation in the dialectical process. The author rejects Adorno’s interpretation that Hegelian dialectics encourages the closing down of discourse and the imposition of a totalising framework. Lanning contends negation in Hegel’s sense actually necessitates the sublation of two rival conditions; in other words, both are simultaneously preserved and transcended. The interaction of two modes of thinking is also based on mediation by external factors that give rise to a qualitatively different outcome. Lanning terms this ‘the positive moment’ in dialectical movement, in contrast to what he regards as Adorno’s fixation on negation. In political terms, this means a concrete formulation for action based on dialectical analysis. Adorno designed his formulation as a means to preserve dynamism in thinking, but Lanning suggests that it actually has the reverse effect: ‘Adorno’s emphases on negativity and a continuous state of non-identity undermines the necessity to comprehend, contextualise and build on the outcome of moments of a process. If such moments come to be seen as ends in themselves, the problem of positivity arises, and the process of development and change is seen to be sufficient, requiring no further movement’( 46). If this explication seems excessively abstract, Lanning supplies a revealing example from revolutionary history of the contrast between Hegelian and Adornian dialectics. Lenin’s slogan of ‘land to the peasants’ in 1917 played a pivotal role in shifting the support of rural workers away from the Provisional Government and towards the Bolsheviks. In order to facilitate the conquest of power, an awareness of the peasantry’s growing disillusionment with, or negation of, the Kerensky regime was inadequate; it was also essential to adopt a policy that would positively shift the gravity of their political allegiance, or positive movement, in the direction of Lenin’s party. As Lanning puts it: ‘The Bolshevik organisation, through which the slogan was communicated, and the ensuing discussion and agitation mediated the transition from one quality of consciousness to another’ (60). The wider question of consciousness forms the other key part of Lanning’s critique. Adorno’s notorious pessimism regarding the possibility of socialist transformation in contemporary Western societies was founded on his belief that the subaltern classes therein have been completely subsumed beneath the apparently iron-clad ideology of capitalism. Adorno’s study of the rise of fascism in inter-war Europe, The Authoritarian Personality (1950), was premised, Lanning argues, on a reactionary assessment of the inability of the working-class to discern the nature of the threat in time. The author summarises Adorno’s view: ‘The masses are incapable of taking up objective discussions of social issues because they lack the ability to distance themselves from a personal relationship to the problem before them and the relative autonomy to make that break’ (136). Once again, Lanning turns to Hegel to construct a refutation of Adorno. In the former’s famous ‘Master-Slave’ parable in The Phenomenology of Spirit (1807) the crucial point of his discussion is the transformation in consciousness that arises as the two roles become aware of their mutual dependence. The personality of the slave is one of craven submission at the start of the scenario, but by the end he has attained a higher level of self-consciousness and dignity due to the realisation that the master needs him. The significance for Lanning is that the parable exemplifies the dynamic and fluid nature of human consciousness, in contrast to Adorno’s reified view in which the ‘masses’ are condemned to indefinite oppression due to their dumb failure to see through the lies of their rulers. Lanning correctly points out that the history of fascist hegemony in Europe in the 1930s is not just one of inexorable submission by workers to Hitler and Mussolini, but also heroic resistance, including critical moments that included the possibility of halting the slide into dictatorship (139). In 1917, Lenin had decisively grasped the window of mediation that arose in his historical situation, but his successors in the 1930s proved incapable of identifying a similar point of positive movement. Lanning’s conclusion is that in the twenty-first century, those who aspire to replicate Lenin’s success are advised to utilise Hegelian dialectics, rather than the substitute offered by Adorno. The author underlines that the political stranglehold of the elite and the quietude of the oppressed ‘are neither pervasive nor permanent conditions, but in order to realise movement away from those conditions there must be conscious and systematic intervention. That is the task of dialectics as a mode of thought and the role of its human agents as a means of action’ (208). He could have added that in this perilous epoch, failure to realise this task will probably see the whole of humanity slide into the abyss, along with Adorno’s Hotel. A comparative study of Adorno’s disengagement and Sartre’s engagement would be an interesting project.